You can let this post evoke jealousy....or just change your whole idea of what "Christmas Food" should be. I love turkey...but thats for Thanksgiving. You still have time to purchase new dinner stuff right??? Comment here to let us know what you'll be having. Typically we have Eggs Benedict...but the hubby isn't a big fan of Hollandaise. Its too tart for him...boo hoo, I like it tart. I may make the whole thing benedict style with poached eggs, English muffins & ham (Canadian Bacon), but use Mornay (light cheese) sauce instead this year. A little compromise never killed anyone. We also add sliced avocado to our benedicts. Yum yum! Frenzied Foodie is on Facebook!!! Right now we are asking about Christmas menus....come share. What is on your menu??? This morning, yes the morning after he finished his 1st semester of college finals, my husband woke up with either the stomach flu or food poisoning. He tried to push through this morning and go to school to finish a non school related project, using the school video equipment. That didn't work...because hes home now and looking like death warmed over. I just made him up my favorite concoction. Icy & cold, homemade lemon-lime "tummy-ade". I absolutely hate lemon lime flavored Gatorade, but this is SO good. Probably because its naturally flavored. Its also cheaper than buying sports drinks at the store. Take water & put into blender. Add sugar, salt & drink mix. Juice lime into the blender. Blend well until all sugar, salt & drink mix is dissolved. Pour all into large empty bottle. Take a glass & fill part way with ice cubes. Pour Tummyade over the ice till glass is nearly full. Pour entire glass of ice & tummyade into the blender. Blend till the ice is gone. Pour back into the glass and tell the sicko to drink! Because its icy cold there is no hesitation in drinking this...its almost like a slushy. Olive Garden has the most amazing "Zuppa Toscana"...yes the translation: Tuscan Soup. Truly I don't care what it means, its just freaking good. Perfect for a cold night...or not so cold. Anytime of day its good really. I'd probably eat it for breakfast. We just had it for lunch...because lunch is our large meal on Thursdays. Brown sausage, crumbling during cooking. Drain sausage & put back into pot. Add onions & garlic, brown a bit. Bring to a simmer for 5 minutes. Season to taste w/salt (it needs a bit) & pepper (I don't add any because I use the Hot sausage & red pepper flakes). Mix all ingredients in an 8x8" pyrex casserole. Bake @ 350 for 30-45 minutes or until golden around edges & hot all the way through. We can typically go through a double batch (9x13" pan) of this at special occasions. It is soo good. Grill/char the peppers & set aside in a plastic covered bowl to sweat. Peel & de-seed the grilled, sweated peppers. Put all ingredients into food processor (except oil) & pulse several times. Slowly add oil to emulsify. Season with more salt & pepper to taste. This is an amazing aioli spread for sandwiches. Especially great on ciabatta bread or grilled panini's. Try dipping fries into this bad boy sauce! My favorite sandwich....a warm grilled chicken breast (herb marinated) sliced, on ciabatta bread, with provolone cheese, fresh tomato & greens with roasted red pepper aioli. OH MY GOODNESS. Oh and did I mention smearing it onto a BLT? Heavenly! Combine all ingredients (except oil) in food processor & blend. This is a THICK vinaigrette. It is not a thin runny dressing. It is meant to be tossed onto a salad, not drizzled. Combine berries & vinegar in food processor & blend. Strain in a chinois (very fine mesh sieve) & press to get all juice. Put raspberry juice/vinegar mixture & sugar into processor & blend. Slowly add oil into processor to emulsify. This is a thicker vinaigrette meant for putting onto a tossed salad, not drizzled over on the plate. Combine all (except oil) in food processor. This is quite possibly the BEST Blue/Roquefort Dressing ever. So yummy! Puree anchovy paste, garlic & 1 c. of lemon juice together. Add all remaining ingredients (except water) & mix together. Add water slowly...if necessary to obtain the consistency you want. Not only is this the most amazing caesar dressing....but gosh darn it I've marinated chicken & shrimp in it too. Yum!!! Wednesday 24th - At the in-laws! Thursday 25th - THANKSGIVING!!! I am giving up all control & we will be at my in-laws. I've never NOT cooked, so this is weird. I AM bringing my Great Grandmas super yummy rolls & some snack items for before the main meal. I have purchased a 24# turkey that is in our freezer for us to roast here at home later & then we'll have plenty of meat for sandwiches. Or maybe I'll just save it for Christmas. Friday 26th - We'll be driving home from my in-laws, then at Apple Hill for the day & home just in time for dinner...hmm. Really not planning tonight. Saturday 27th - Dinner out with EQ before our Temple Session. Wednesday 17th - Family Night Out....2 weeks ago I purchased (4) $12 vouchers for Johns Incredible Pizza. They were valued at $115 full price. The deal included an all you can eat buffet dinner (pizza, pasta, salad, baked potatoes, soup & bread-sticks), drinks & dessert, plus 4 game cards worth $15 each. For 5 of us this was an incredible (haha) deal. Plus we needed time out. A stand-by, go-to, easy meal that even our 11 year old makes. I make this (pretty much every time) I am asked to make a meal for someone at church due to illness, birth, etc. It freezes well too...directions are below. In large bowl mix all the above ingredients. Season with herbs, garlic & pepper per your taste. Evenly divide into 2 (9x13) casserole dishes. Bring rice & water to a boil on stove top. Let boil about 5 minutes. Reduce to a simmer & cover with lid. Simmer till water nearly full absorbs. Shut off stove & let sit a few minutes. Add a scoop of rice to each plate & top with creamy chicken & veggie mixture. Roll crescents or seperate biscuits. Place on top of bubbly chicken & veggie mixture. Place back into oven for 12-15 minutes until biscuits/rolls are golden brown. Serve big scoops of chicken, veggies & biscuits in bowls. Shhh, Don't tell....sometimes I make brown rice & put a scoop in the bowl & then top it with the biscuit version. After mixing in bowl & prior to cooking put into freezer safe casserole dishes. Cover well with plastic wrap & foil or plastic wrap & lid. You may also pour into freezer bags & label with cooking directions. Place in freezer. Fully defrost before cooking. Cook rice the day of only. After mixing in bowl & prior to cooking, put into freezer safe casserole dishes. Place biscuits on top. Cover well with plastic wrap. Then cover well with foil or pan lid. Place in freezer. Fully defrost before cooking. I've posted several recipes & will be posting more that use or become large quantities. Yes, these are restaurant & catering recipes. It will take you a while to use 1.5gallons of salad dressing, but its worth making. Thats because they are AMAZING recipes! Most of them can be used for parties or holidays. They can also be frozen for longer storage. If you have any questions, feel free to comment and I'll get back to you. Season with salt & black pepper. Friday 12th - Football Game!!! Yeah I know...Petzels & Jello??? Its so freaking good. Yeah its "oh my goodness" good. Mix together & spread in a deep 9x13 or 11x14 pan. Bake @ 350 for 10 mins, then cool. Pretzels will move, so spread carefully to keep crust in place. Heat juice till near boiling in microwave. Dissolve Jello in hot juice. Option 1: Slice frozen berries & place over top, pour jell-o mix over the top of the cream layer. Option 2: Toss frozen berries in blender, pour jell-o mix over the top & pulse a few times to chop berries. Pour jell-o & berry mix over the top of cream layer. You don't have to ask twice. These are amazing with strawberries & whipped cream. I like waffles as breakfast for dinner....so its listed in both categories. They can be pretty time consuming for breakfast unless you are using the pre-done mix in baggies, so I make them for dinner when I have more time OR I make the whole batch & freeze them with wax paper in between...then they make easy toaster waffles. Yes! Mix can be set aside in freezer bags or used immediately. Mix in butter & water. *You can also use 1/3 of dry mix with 1 egg, 1 c water & 2 Tbsp of butter for smaller batches. In a food processor, combine flour, sugar, salt and butter. Pulse until dough comes together into a ball. If the dough is too sticky add a little more flour so that you can shape the soft dough into a ball. Wrap the dough ball in plastic wrap and refrigerate for 20 to 30 minutes. Sprinkle some flour onto your work surface and roll the dough 1/8-inch thick. Using a 2-inch round cookie cutter, cut out the cookies and transfer to a parchment lined baking sheet. Bring the dough scraps together and gently press into a ball. Flour your work surface, re-roll 1/8-inch thick and cut out more rounds. *I cut these out even a bit smaller using a shot glass & they only take about 8ish minutes to bake at the same temperature. Bake the cookies until they are golden and firm, about 15 to 20 minutes. Remove the cookies from the oven and let cool for 5 minutes before transferring them to a wire rack to cool completely, about 25 minutes. Place the dulce de leche in a small bowl and (if you are adding the spice) stir in the cinnamon, cloves, and nutmeg. Spread about 1-2 teaspoons of the dulce de leche on the flat side of a cookie and sandwich with the flat side of another cookie. Place the cookies on a platter, dust them with powdered sugar, and serve. Makes 16-18 cookies (2") or 2 dozen shot glass size cookies. I usually make a triple batch...at least. Who loves funeral potatoes??? I DO!!! Who loves Mexican food??? I DO!!! Who loves Mexican Funeral Potatoes??? WE ALL DO!!! This is a sweet spicy little twist on funeral potatoes! Don't know what funeral potatoes are??? They are the LDS/Mormon dish traditionally served....at funerals anything. Nobody claims these are healthy. They just taste amazing. 1 Tbsp of fresh ground black pepper. Spray bottom of 9x13 pan with Pam or cooking spray. Dump in tots and spread evenly. Heat up cheese in microwave a bit then pour or spoon over tots. If using the cream of ....soup, spoon it over tots & cheese. Drain Rotel of 1/2 the liquid (not all). Add Rotel & Diced Green Chilis. Sprinkle liberally with garlic powder & fresh black powder. Bake @350 until bubbly in the middle...about 45 minutes. Can be topped with a nice layer of cheddar cheese or some sour cream or a sprinkle of green onions...or nothing at all. Ok heres the deal. I'm pretty sure this makes 2 cheesecakes...maybe 3. No its 2. Its 2 HUGE cheesecakes. I'm serious people. They're HUGE. But they are the best cheesecakes you'll ever taste. Yes its from that elusive restaurant in Chico where I used to work. Enjoy! Whip cream cheese till smooth. Add 1 egg at a time until smooth. Add all other ingredients 1 at a time, till its smooth each time. At this point you can also make this into one of the AMAZING variations at the bottom. Mix in food processor with short bursts. Press in spring form pans (12" spring form pans) about 1/4" thick. Toast in 350 F oven for 10 minutes or until lightly golden. Place a water bath on the lower rack of the oven (a 9x13 filled with as much water as possible). Spray oven with water bottle (spritz bottle with warm water into warm oven), don't spray your light bulb! Put cheesecake into oven on the rack directly above the water bath. Turn oven down to 325 F.
Bake an additional 45-50 minutes. Let cake stand in oven 1-2 hours. Using about 1/2 of the basic batter recipe! Add 3 shots of espresso to 1/2 of the above batter & mix well. Put 1/2 of the now espresso batter into the bottom. Top with 1/2 the plain. Top with 2c mini chocolate chips. Top with rest of the espresso batter. Top with the remaining plain batter. Swirl carefully with a knife. Add 1c. of finely chopped walnuts to 2c. of the crust mix before baking the crust. Add 32oz of pumpkin to the batter. Add freshly grated nutmeg, cinnamon & cloves. This is not a swirl recipe it is totally pumpkin. Yes. Jenny makes some of the BEST cookies I've ever had. Her sugar cookies are SOOO good. Oh my gosh, they're almost exactly like the thick fluffy sugar cookies you find at the store. Cut with favorite cookie cutters. Use greased cookie sheet and bake at 375 for 7-8 minutes (or until edges look SLIGHTLY tan and done). I've eaten Jennys frosting & love it. I've never made it myself, I just make my own. But if you want the whole package then here is here recipe for that too. Add enough powdered sugar and milk to form a spreadable frosting consistency. Another recipe courtesy of Jenny. You should have seen my reaction after she gave me my first one. You should have seen her reaction to the alternate version below....YUM! Crush nilla wafers in large ziploc with rolling pin- to a fine powder. Set aside in shallow dish. Dump cool whip tub in to large mixing bowl; set aside. Melt hershey bars in microwaveable dish, If using Hersheys with Almonds, then chop them up first. Freeze mixture for 1/2 hr. Drop spoonfuls of cool whip mixture into nilla wafer crumbs and coat. Place "blobs" on wax paper covered cookie sheet. Freeze for 20 minutes then place in ziploc/airtight container. Although they wouldn't last on the counter anyway - they get eaten in seconds. HEAVEN in a blob....oh yes. My friend Jenny makes these amazing peanut butter cookies packed full of peanut butter chip & chocolate chips! They are amazing. I'm not a crunchy pb fan so I only use creamy, but you can use whatever you like. I figured I needed to share the love with my friends...& give Jenny credit. Cream sugars, peanut butter, butter, and eggs. Try not to eat all the batter - they taste good baked too, I promise! 1. Preheat oven to 350 degrees F. In stand mixer, cream butter and sugars until light and fluffy. Beat in eggs and vanilla until well combined then add pumpkin. 2. Place flour, salt, baking soda, cinnamon and nutmeg into large bowl; mix to combine then slowly add to wet ingredients then chocolate. Mix only until just combined. 3. If using baking sheet, scoop medium cookie scoop of dough onto a silpat or parchment lined baking sheet, about an inch apart. Bake for 9-11 minutes or until edges just begin to brown. Let cool on pan for 5 minutes before removing. Is well worth the stop if you are in the area. Be prepared to eat in your vehicle....because this place is small. They've got room for 4 at the bar and 4 outside. There is always a wait! This place is full of locals, ski bums, bikers & campers stopping on their way to the lake. Located in Amador County. In the town of Pine Grove. About 15 minutes "down hill" (west of) Pioneer or 10 minutes "up hill" (east of) Jackson CA. Directly across the street from the fire station & Pine Grove Park. This place is a classic hamburger joint...and a total dive. Order a shake! They're made of real ice cream!!! Juicy ALL Beef Patties are pounded out in front of you for each order and slapped down on the sizzling flat top grill along side the buns! No salt or pepper is added. Pure unadulterated, cow flavored, red meat is on this big guy. Cheese is layered on at the perfect time....American is the ONLY cheese available. Burgers are topped with mayo, mustard, lettuce, thick slices of FRESH onion & tomato. But they of course are all made to order for picky guys such as my hubby...no onions and mayo for him. If you want to purchase a whole pickle they will slice it and add it to your burger. You can order a single with cheese like mine, which is pictured above. Let me share that drippy cheesy goodness with one more picture. We haven't been to a certain "local specialty cookie bakery" in months. I know its been at least 6 months, but thinking back now its probably been closer to 9. Well I've been trying to "recreate" a cookie from this place and hadn't had one in so long I needed to try another to see how close I may or may not be getting. I'm close. This cookie is my favorite (at this bakery) its half peanut butter cookie & half chocolate cookie....swirled together. I know it sounds like a simple cookie to make. However, its actually many things that make recreating a recipe (especially a baked product) hard to do. First the proportions of dough. On this they seem to be 1/2 & 1/2. But sometimes its more peanut and less chocolate. Second the amount of chocolate in the chocolate cookie dough.....thats actually part of the problem. Then the consistency of the cookie itself...the peanut butter is creamy and so is the chocolate and this bakery makes a large cookie and manages to keep it soft all the way through, with just a slight bite at the edges. No crispy on this cookie. Peanut butter cookies tend to fall apart if baked too soft and dry out if baked even 2 minutes too long. On to my disappointment...the cookie I'm trying to recreate is amazing. It still is amazing. I decided to splurge and buy a cookie we'll call a "chocolate crinkle"....yeah hush if you know the real name. It was disappointing. I've had it before and never noticed the lack of cocoa. No really, there wasn't enough chocolate flavor...and the powdered sugar honestly was killing what little chocolate I could taste. Blah. So the problem is that most people assume this chocolate cookie is the other half of the 1/2 peanut & 1/2 chocolate yumminess. After tasting it again...and being disappointed with the chocolate cookie itself I am convinced otherwise. Ya never know what you aren't missing till you go back and try it again. Darn my memory and giving it another chance! Roux....made from bacon grease & flour. Put potatoes in the crock pot. Bake bacon in oven & chop into pieces once crispy. Cook in crock pot for a while. I know...lack of directions and real measurements. Whatever! Its the basic concept. Ladle into bowls and top with cool sour cream & chopped green onions...plus fresh cracked black pepper. Yum. -Pour 1/3 of batter in DO. -Add 1/2 choc chips on top of batter. -Add some mallows & nuts. -Pour 1/3 of batter in. -Add 1/2 choc chips on top. -Pour last 1/3 of batter on top. -Put other 1/2 of cube of butter on top in pieces. -Cover & bake about 30 minutes or until cake is finished. -Remember to check that the cake is finished...but there will be gooiness because of the chocolate chips & mallows. -add 1 1/2tsp of cinnamon, pepper & a few Tablespoons of brown sugar. -Cover & Bake 30-45 minutes or until bubbly. -Melt 1/2 of butter in DO. -Pour in 1/2 of cake batter. -pour in all cherry pie filling. -Pour in other 1/2 of batter. -Place of 1/2 of butter on top of batter in pieces. -Cover & Bake for 30ish minutes. -Bake 45 mins to 1 hour. - Oil bottom of pan well. - Make sure there is about 1/4 inch of oil in whatever pan you use. - Add rice & water stir well. - Bring rice to a boil, then cover & reduce to a simmer. - Once rice is finished, fluff with fork. - Pour lime juice into rice. - Sprinkle cilantro over rice. - Fluff again, while mixing in the lime juice & cilantro. - You can also cook via dutch oven. Makes 6 cups of rice! -Season chicken & onion while cooking with garlic, cumin & chili powder to your taste. -You may add some cayenne if you don't mind spicy. -Add green chiles & mix. -In 12" dutch oven pour an ample layer of green enchilada sauce. -Layer tortillas, an ample pour of sauce, then chicken, then cheese. -After final layer add an extra layer of tortillas & pour remaining sauce over the top. -Place lid on dutch oven & cook for 30 minutes @ 325 via basic dutch oven directions. -Serve with more tortillas, cilantro lime rice & sour cream. This makes 1 12" dutch oven sized batch. You can easily feed...8 people. Yes its sort of a make to your taste sort of recipe...sorry for lack of measurements. These pancakes are SO yummy & pretty darn healthy too. Yes, they are similar to IHOP's "Harvest Grain N' Nut Pancakes"....only better. Grind oats/oatmeal & nuts to "flour" in blender or food processor. Put all dry ingredients in 1 bowl & mix. Put all wet ingredients in 1 bowl & mix. Blend wet ingredients into dry ingredients. Cook 1-3 minutes per side till desired done-ness. NOTE: These are slightly heavy and VERY filling. (My hubby only eats 3 of these and is FULL.) I like to serve them with fresh fruit syrup, fresh fruit, applesauce or just butter. Let me preface this review by saying I grew up going to Casa Lupe in Chico and occasionally the Hamilton City location too. I think they existed in Chico & HC since we moved to Chico in 1986. That was the cool place to go! They made their own tortillas by hand and then on their totally cool machine....LONG before Chevy's had "El Machina" or before their was even a Chevy's nearby. To be honest Casa Lupe probably exsisted LONG before Chevy's did at all. They had a seperate bar area, kept things very family oriented, had a neat recessed fountain area in the Chico locale and the fajitas are TO DIE FOR. Simple, but perfect. Their salsa was different and still is. It is watery and chunky in consistency...which throws people off. It has big peices of celery, onions, bell peppers & tomatoes in a semi spicy but yes watery base. Its not authentic at all, but still yummy. The family owned restaurant had locations in Chico, Hamilton City, Gridley & Yuba City. Slowly the locations closed and they are left with the Gridley location & Yuba City location only. I remember going to Casa Lupe the week before I moved to San Diego in 2002. Then after the move, a marriage, a couple of babies, a deployment, another move or 3 and a trip back to Chico in 2006 I discovered the location had closed. The Hamilton City location was gone too. Up in that area they have been replaced with Casa Ramos. A good mexican restaurant which I will eat at when I'm "home". -The food is still good! Its pretty much the same as it always has been. I still love the salsa, you can find it odd if you want, but its something about the flavor. The FAJITAS are still where its at. Jesse and I split a Steak Fajita Platter which can feed 2-3 people. They come with fresh corn or flour tortillas (6), rice, beans with melted cheese, sour cream, guacamole and the sizzling hot platter of sauteed steak, onions & mixed bell peppers. -Service is typically good. I'll be the first to admit the wait staff can be over taxed and spread too thin at points if it is busy. Its best to go in later in the evenings. I still love the wait staffs "uniforms" or shorter black skirts and little white Mexican blouses with embroiderd flowers. The girls are all typically very pleasant. -The current Manager Antonio leaves something to be desired as he is not a pleasant person and cusses publicly. I will not go back to Casa Lupe due to the experience with him alone this Wednesday. Below is a message I'm sending to every available resource in order to get the problem addressed. It was horrible. Dirty Mouths At Casa Lupe! Wednesday evening our service from Martha was excellent. The fajitas were great as usual. The atmosphere....not so pleasant. The entire time we were eating we listened to the foul mouthed MANAGER Antonio stand in the lobby area loudly conversing with 2 of his buddies. Antonio proceeded to harass one of the female employees with words I would not have been comfortable having said to me. He and his friends cursed like sailors. Multiple expletives were used but one in particular was their favorite. A word which elevates even a movie to a rating of which I will not attend. Why use it??? Why in public? Why in a family restaurant??? I was completely disgusted by the time we left and plan to never go back, unless Antonio is gone. I don't care whether he is family or not, but he should no longer be employed at a reputable establishment such as Casa Lupe. I wanted to say something as we left, but knew I could not contain my anger if I had. It was so horrible. There were 8-10 paying customers left in the restaurant when he began his verbal vomiting. Antonio should respect the fact that he has a job right now. The current economic situation is not something to joke about. Antonio’s job should immediately go to someone who respects their position, has a clean mouth and understands a little bit more about appropriate actions in public. He should be ashamed! German Pancakes are yummy fluffy goodness. Pretty much a twisted version of crepes. 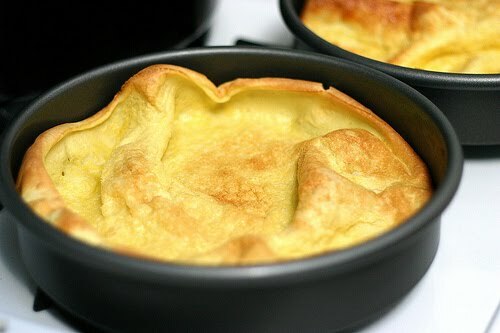 Also known as Dutch Babies." They are PERFECT with some more melted butter and a squeeze of lemon. Or powdered sugar sprinkled like crazy by children....& sliced strawberries a plenty for mom. Dad says Nutella is his favorite topping. Make these as minis and children can mess up their own plate with toppings they like and you don't...such as peanut butter and sprinkles. Cooking Options: two 9-inch cake pans, 1 9x13 pan, 2 full muffin tins (24). Butter which ever cooking pan WELL with more melted butter!!! Put EVERYTHING into the blender. Blend really well, until super smooth. Pour into prepared pans and bake. Muffin Tins - 15 minutes. 2 9" rounds - 20 minutes. Serve with lemon slices, powdered sugar and butter if you are a purist. Other people like fruit or maple syrup. Drop 2 Tablespoons of butter into a cast iron pan. When butter is well melted & pan is hot, remove pan from oven & swirl butter around. Pour batter quickly into pan and put back into oven. Blueberry muffins with a streusel top. This recipe hails from moi! Adapted slightly from a recipe I learned in culinary school. Amanda- This is upon your LATE NIGHT request! Bake ANOTHER 10 minutes or until a toothpick/skewer inserted in the middle comes out clean. I finally posted my strawberry freezer jam recipe from last year. I also made Peach freezer jam and this recipe was sitting there waiting to be posted as well. Last year @ the Marysville Peach Festival I purchased a full lug of Red Haven Peaches. These peaches were gorgeous. They were the color of the sunset...the sunset in CA during fire season! The jam turned out equally pretty. It was so close in color to my strawberry jam its crazy, just a bit orangey in comparison. Wash & Rinse "jars" or containers. Measure EXACT amount of fruit (3 c.) along with the lemon juice (2 T) into a large bowl. Measure EXACT amount of sugar (4.5 c.) into a separate bowl. Stir sugar into fruit. Mix well. Let stand 10 minutes, stir occasionally. Stir 1 box of pectin into 3/4 c of water in small saucepan. (Pectin will start out lumpy.) Bring to a boil on high heat, stirring constantly. Boil 1 minute, stirring constantly. Remove from heat. Stir pectin mixture into fruit & sugar mixture. Stir pectin/fruit/sugar mixture until the sugar is completely dissolved and no longer grainy, about 3-5 minutes. Pour or ladle into prepared containers, leaving 1/2 inch of space at the top for expansion during freezing. Cover & seal with lids. Let stand at room temperature 12-24 hrs until set. Refrigerate up to 3 weeks. Otherwise store in the freezer for up to 1 year. Thaw in refrigerator. I'd add a picture...but I took it with my camera phone last year too. Its gorgeous. I'll be making more in July. Its THAT season again!!! Yep, Strawberry Season!!! So what does that mean??? Freezer Jam!!! Its EASY....I PROMISE. I make it in up to TRIPLE sized batches...because I'm insane. Measure EXACT amount of fruit (2 c.) into a large bowl. Measure EXACT amount of sugar (4 c.) into a separate bowl. I'd add a picture...but I took it with my camera phone last year. I'll take pics next week when I make more. Its bright pinky red and looks like strawberry jam!!! Its so yummy. Make lots!!! NOTE: This recipe does NOT call for lemon juice, but it can be added as well. 1-2 Tbsp can be added to the fruit BEFORE mixing it with the sugar. NOTE: If you crush your berries and leave them overnight, DO add the lemon juice and cover with plastic wrap directly on the crushed berries. This will prevent browning & fridge flavors from getting in. I LOVE CLAM CHOWER. L.O.V.E. LOVE!!!! Its true. This is quite possibly the easiest clam chowder recipe I know that still retains a true chowder style...with chunks and pieces. This is a large crock full and feeds....well I don't know. I take it to Souper Saturdays, feed my hubby and kids and well WE LOVE chowder. So real portions....a lot. People who like yumminess...maybe 10. Saute onions & celery in the stick of butter on the stove. Put cream of mushroom soup in crock pot. Add clams AND their juice. Thicken as needed with a bit of cornstarch in cold water (only if necessary). If you don't like mushroom soup you can also use cream of potato or celery. Crush cookies and stir in softened cream cheese. Use the back of a large spoon to help mash the two together....or use a Kitchen Aid Mixer. Once dry, refrigerate and enjoy! You can also use mint oreos or peanut butter oreos or strawberry cream oreos. Yum! You can coat in white or regular chocolate "bark". You can use small cookie cutters to form into shapes...such as hearts or stars or roll into footballs instead of traditional balls! I recently started teaching a new class for Relief Society, these are offered in addition to my FUNdamentals of Food classes. The 4-part series is called "Stretching Your Budget" and it was designed with the current economic issues in mind. The 1st class was "Menu Planning & Easy Meals". One of the biggest things we discussed other than the whys and hows of menu planning was our easy "go to" meals in our families. If each family has approximately 14 go to meals for dinner then you can easily menu plan. Not only easily but quickly. I'm sort of a cheese snob. However there are 2 companies who make cheese which aren't very snobby. One is Tillamook. The other is Cabot. Tonight I'd like to share a little bit of yummy knowledge about Cabot. We made quesadillas tonight as a snack....using Cabot cheese. Cheese we found at Grocery Outlet. Sun-dried Tomato Basil Cheddar quesadillas!!! All because of the yumminess that is Cabot Cheese. They also offer flavors such as Chipotle, Habanero, Chili Lime, Horseradish & Garlic/Herb. For "Valentines Day" we luckily had a sitter in town all weekend...thanks Mom!!! So we headed to Sacramento for a date night on Firday as we had church obligations on Saturday and Sunday. We went to Enotria....meaning "land of wine" or "land of untrained vines". Enotria is located in North Sacramento on Del Paso. Directly across the street from Iceland Skate Rink. If you can get over the slightly shadey neighborhood then you are in for a treat. There is plenty of off street parking in the lot nears their east side and patio, but street parking in front of the door too. Enotria is know for its amazing wine selection and and equally amazing sommelier. I can't give any recommendations, its been years since I drank...but I did overhear that they had some Amador County wines which grow a stones throw from my in-laws. Anyways... we avoided the Prix Fixe Menu and selected our own combinations from the dinner menu. Service was the best we've EVER had ANYWHERE. Our waiter, our busser, everything. We were the only ones there the first 45 minutes we were there...our drinks constantly full of fresh water. A very, very pleasant experience. Perfectly cooked pillows of goodness...a slightly tangy sauce. Amazing wild fungi, but safe. SOO good. Jesse refuses to touch anchovy fillets...so I ate it with a piece of bread. Yum. I also tried the salad and it was crunchy and perfect. Not too much dressing like most caesars these days. The roasted beets were amazing and the silky goat cheese. Yum! Jesse recently discovered lamb and I looked at menu after menu making sure he had the option wherever we went...this was amazing! Plus I've never had more amazing lentils. Really. This had amazing flavor, but the bread pudding (stuffing) was a bit gooey and the bird a bit tough. Coq is very hard to cook to perfection, so this was really close. For dessert its hard to turn down a Hot Chocolate Lava Souffle. Yeah it was perfect and baked from scratch, to order. Topped with raspberry coulis. Yum. Can you tell he wanted some??? This is my Great Grandma Tennants roll recipe. Feel special I'm sharing. They are SO good. Plus I'm named after her! Dissolve yeast and 1 tsp sugar in 1/2 c warm water. Let stand 20 minutes. Add 1 c. cool water to hot liquid mixture. Put 3-4 cups of flour into mixing bowl. Add tepid shortening mixture to the mixer. Add yeast mixture & beaten eggs. Add remaining flour slowly in increments until you make a slightly sticky, but firm dough. This is not stiff bread dough. Put dough into a large "tupperware" bowl with lid or plastic wrap. Place in refridgerator for 3-4 hours to rise. Dough will keep up to or just beyond 1 week in the fridge. Take as much dough out of fridge as you will need. Let rise 20-30 minutes in a warm place for fluffier rolls. Bake @ 400 (375 convection) for 15 minutes. Makes 3 dozen small rolls.